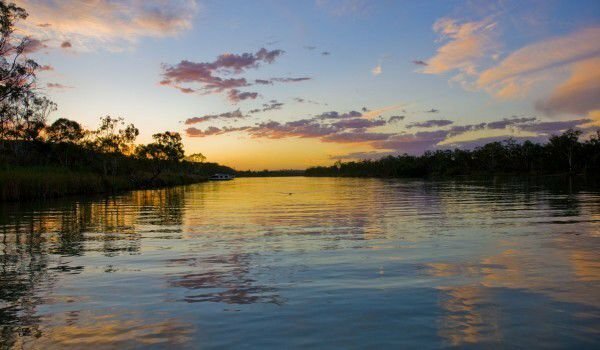 Murray River is the deepest, the largest and most important Australian river. It runs through the southern part of mainland Australia, and springs from the Australian Alps, which is the common name of the highest mountains in South Australia. Murray River flows into the Indian Ocean coastal lagoon of Alexandrina. The total length of the Murray estimated at 2370 km. Together with the largest river in Australia, in the Australian Alps springs also Darling River which is the biggest and most important tributary of the Murray. Together the two rivers form the largest water and indeed the only powerful river system in Australia. The length of the Darling River reaches 2830 km. Rivers of the system of Murray Darling gain their water supply mostly from the Great Dividing Range, as that part of the Australian Alps is known. Catchment area of the Murray - Darling covers about 15% of the territory of Australia, an area equal to France and Spain combined. River Murray’s irrigation accounts for nearly all drinking water from the city of Adelaide with one million inhabitants in it. Distressed inlets of Murray and Darling are minor and sporadic, so both rivers have an irregular regime. Because of its great importance and significance to the population living in this southern province, Murray was called by a stranger the “Australian Nile”. Other rivers in these areas are small and dry up due to the hot and dry climate. Murray and Darling have an unstable regime, taking into account the sharp fluctuations in river level. During floods, they cause much flooding, flood agricultural land and even interrupt roads. Waters are regulated by building dams and irrigation facilities. The main functions of the Murray are associated with irrigation, water supply and the needs of industry. Murray reaches the ocean water in Lake Alexandrina. On its way, the Murray passes through several lakes of varying salinity, which in the past were freshwater lakes. In some of its parts is a navigable river, and it’s fish wealth is quite large and diverse. Australia has long shortages of water resources, because this is the driest inhabited continent on Earth. The inflow of water into rivers is usually low, and farmers located along the Murray face serious constraints in irrigation. Australian authorities have taken action in order to ensure direction, regulation and redistribution of water resources. Because of the droughts, strict restrictions were introduced in major cities of the Murray, in the irrigation of gardens, and in most places, it is prohibited to use hoses, to wash cars. The water inflow into the largest Australian River, Murray, has doubled compared to previous years but is still 25% of average, in the long run. Lakes near the mouth of the river are described by government as "in deplorable condition." Farmers in the pools Murray - Darling grow irrigated crops such as corn, cotton, rice, grapes, fruits and vegetables. The river is needed for farming, which includes a developed dairy industry. Until recently, using irrigation equipment, water was pumped from the Murray. The main actions of government are related to buying from these farmers, the water rights. Principal motive is that into the riverbed should flow more water, to prevent salinization, particularly in the mouth of the Murray, where the river struggles to reach the sea almost constantly, because of accumulation of sediments.